Administrators EY released documents showing suppliers owed £484m of total debt estimated late on Friday at £884m. The distributor said it had no comment to make when contacted by the BBC. The administrators said the total owed was "subject to change". Fashion brand Jigsaw has removed stock from its 20 House of Fraser concessions, and Karen Millen - which is owed more than £950,000 - is understood to have followed suit. Others are owed even more: Mulberry is out of pocket by £2.4m, while All Saints is owed close to £1.8m and Giorgio Armani almost £1.6m. Sports Direct has said it wants to "restore the right level of ongoing relationships" with its brands. Mr Ashley has also vowed to keep most of House of Fraser's 59 stores open. But some customers are angry about the treatment of their orders. One said on Twitter: "Absolutely disgraceful. Ordered a £90 purse last Thursday. Yes a week ago for my daughters birthday. Not 1 email concerning delivery or info and now order cancelled and you say email in a few days!!! Get my money back ASAP." Another said two-thirds of their husband's suit would not now be delivered. They tweeted: "This was for our holidays! I don't have time to go back to Edinburgh with the trousers which are now totally useless! What do you suggest I do!" Richard Lim of Retail Economics said there were "kinks to be ironed out" when big companies change hands, but warned that "trust and loyalty are hard-won in retail". He added: "You would have thought that delivering a great service to customers would have been a priority for the company. "Delivering goods into the hands of customers now has to be the top priority." Kent-based Rob Brice and his wife were given £500 of House of Fraser gift vouchers by his grandmother for their wedding. Last week he placed an online order worth about £380. After hearing nothing for five days, he sent an email and was told they were no longer accepting gift cards, meaning "my leftover value on the card was lost". Another email said his order was cancelled and the sum would be refunded to the gift card - one he says is now no longer useable. Mr Brice has called House of Fraser but only gets an automated message. Neither has he had a response to emails and tweets. "I'm going to look to call Trading Standards today to understand my customer rights in the matter, as it is a lot of money to us and would have been to my nan," he says. 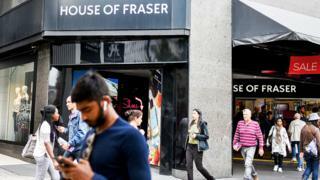 Meanwhile, EY has said there were six bidders for House of Fraser, with four - offering between £40m and £49m - being dismissed for various reasons. This left two potential names in the frame, with one of the remaining pair offering £1 to acquire the group on a solvent basis. This party then later proposed to acquire the business and assets following any insolvency for £100m - £10m more than what Sports Direct ultimately paid - before withdrawing. Also, EY said there will be £600,000, at best, left to pay unsecured creditors but the prospect of any payout is minimal. Q: What will happen to my House of Fraser online order? If items are in stock, shoppers may still receive them. However, customers are being emailed over the next two days to formally cancel pending orders and be refunded in full. Q: Can I return an unwanted item bought online for a refund? Yes. Anyone wanting to return existing purchases will have their statutory rights honoured. Q: What happens to gift vouchers? Customers with a store card should write to Gift Cards, 27 Baker Street, London, W1U 8AH and it will be replaced by one of equivalent value for use in future House of Fraser (but not Sports Direct) stores.